The SOLFRUNT 1986 Solid Front process gauge has a 4 ½” gauge size, and has a MONEL seamless bourdon tube and socket. The Model 1986 pressure gauge is typically used for HF service (hydrofluoric acid) during the alkylation process at a refinery. This pressure gauge has a solid front black glass reinforced thermoplastic (PBTB) turret style case for chemical and petrochemical processing applications. For users needing a liquid filled pressure gauge the 1986 comes standard with an E-Z Fill field fillable case. No extra parts are needed to make this gauge a liquid filled pressure gauge. It is also available with an optional yellow or orange case. The Model 1986 process gauges are supplied in 21 vacuum, compound, and pressure ranges from 30" Hg vacuum through 10 000 psi. 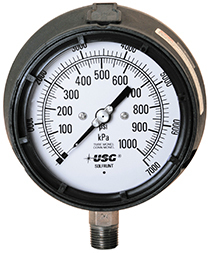 Standard dials are single psi gauge pressure, but the gauge can also be ordered with dual scale psi/metric scales or custom dials. All Model 1986 pressure gauges are RoHS compliant to the EU directive 2011/65/EU. Standard, no extra charge. The EZ Fill case allows the end-user to liquid fill the gauge in the field, without any special parts or equipment. Just pull the fill plug and fill with your fill fluid to create your own liquid filled pressure gauge. Order Code: SR - Shatter-resistant glass replaces the standard window. Order Code: YEL or ORG - The standard black thermoplastic case with be replaced with an orange or yellow case providing better visibility.